How can I protect my baby from Infant Botulism? Botulism is an illness that can happen when a person’s body ingest toxins from a bacteria called Clostridium botulinum. It is an illness that poses serious threats, especially among young babies, as those who have contracted the disease may not recover fully. The condition can be frightening because it can cause muscle weakness and breathing problems. Foodborne botulism.The harmful bacteria thrive and produce the toxin in environments with little oxygen, such as in home-canned food. Wound botulism.If these bacteria get into a cut, they can cause a dangerous infection that produces the toxin. Infant botulism.This most common form of botulism begins after Clostridium botulinum bacterial spores grow in a baby’s intestinal tract. It typically occurs in babies between the ages of 2 months and 8 months. Infant botulism is treatable, but because of its severity, it’s important to learn the symptoms so you can recognize it early. Also know that honey is a known source of the bacteria spores that cause botulism. For this reason, honey shouldn’t be given to babies younger than 1 year old. If infant botulism is related to food, such as honey, problems generally begin within 18 to 36 hours after the toxin enters the baby’s body. But very young babies haven’t developed the ability to handle the spores yet. So if an infant ingests them, the bacteria germinate, multiply, and produce a toxin. That toxin interferes with the normal interaction between the muscles and nerves and can hamper an infant’s ability to move, eat, and breathe. Symptoms of botulism begin between 3 to 30 days after an infant ingests the spores. Constipation is often the first sign of botulism that parents notice (although there are many other causes of constipation). Call your doctor if your baby hasn’t had a bowel movement in 3 days. Infant botulism can be treated, but it’s important to get medical care as soon as possible. Call your doctor right away and seek medical attention if you see any of the warning signs in your baby. Infant botulism is treated in the hospital, usually in the intensive care unit (ICU), where doctors will try to limit the problems the toxin causes in the baby’s body. 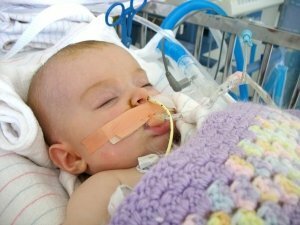 The toxin can affect the breathing muscles, so doctors may put the infant on a ventilator. Because the toxin can affect the swallowing muscles, they may give the baby intravenous (IV) fluids or feedings through a tube to provide nourishment. Like many germs, the Clostridium botulinum spores that cause botulism in infants are everywhere in the environment. They’re in dust and dirt, and even in the air. Experts don’t know why some infants contract botulism while others don’t. One way to reduce the risk of botulism is to not give infants honey or any processed foods containing honey before their first birthday. Honey is a proven source of the bacteria and has led to botulism in infants who’ve ingested it. Light and dark corn syrups were thought to be a source of spores, but no proven cases of infant botulism have been linked to them. However, check with your doctor before giving these to your baby. https://tyt.com.my/wp-content/uploads/2018/04/TYT-logo-transparent_1000x1000_square-180x180.png 0 0 Cheah Houng https://tyt.com.my/wp-content/uploads/2018/04/TYT-logo-transparent_1000x1000_square-180x180.png Cheah Houng2018-08-13 13:40:042018-08-13 13:40:39How can I protect my baby from Infant Botulism? 患上了手足口病，该如何护理？ How to Ease Your Child’s Feelings When He/She is diagnosed with HFMD?